Each year, nearly one in five Americans will experience a mental health concern and countless more will watch a loved one struggle with mental illness. In Cook County alone, 200,000 residents will experience a severe mental health episode each year. When mental illness strikes, friends and family often struggle to understand the available medical, legal, and supportive services; how they intersect; and how they can be accessed on behalf of a loved one. The Mental Health Pro Bono Pilot Program will provide much-needed assistance to families struggling to get legal help for their loves ones during and after a severe mental health episode. As a pro bono volunteer, you will work directly with families, offering them vitally important information about their legal options ranging from guardianship to involuntary inpatient commitment. Join the CBA’s Legal Aid Committee on Tuesday, March 6th at 3pm for a multimedia, interactive video and panel CLE presentation designed to help legal professionals better understand the life circumstances and day-to-day challenges of their clients who are experiencing poverty. Expert panelists will provide practical strategies to help legal professionals communicate more effectively with their clients and improve client services and case outcomes. Attendees will receive 2.75 PR-CLE credits. Learn how you can represent victims of hate crimes on a pro bono basis at Fighting Hate Crime in Illinois: An Overview of Criminal and Civil Remedies and Protections, presented by the Chicago Lawyers’ Committee for Civil Rights Under Law at Kirkland & Ellis on October 18 from 3-5 pm. Two hours of CLE credit will be available. Have you ever wondered if mediation is for you but didn’t have the resources to commit to a standard 40-hour training program? Attend the Center for Conflict Resolution’s one day training on November 4th to learn the basics, how to become a CCR volunteer, and earn six CLE credits. Interested in doing pro bono work and want the opportunity to explore different types of cases and time commitments? Chicago Volunteer Legal Services (CVLS) is having a new volunteer orientation on Thursday, August 24th at 12:15pm at their offices (33 N. Dearborn St., #400) where you can sit down with a CVLS staff attorney as they take you through the ins and outs of being a CVLS pro bono attorney. 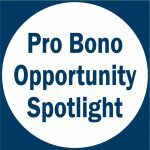 Interested in non-litigation pro bono work with flexible day and evening training/volunteer options? CARPLS, the Cook County legal aid hotline, offers the majority of its training online, and the next in-person portion will be offered on July 12 at 10am, 2pm, or 5:30pm. No experience is required and attendees will receive CLE credit. Interested in helping someone get a fresh start? The Cook County Second Chance Expungement Summit will be held on Saturday, June 10. Volunteer attorneys are needed to review the criminal records of attendees, determine whether they qualify for adult expungement or sealing, and assist with the filing of court forms. A required training session for volunteer attorneys will be held on May 31, from 3pm-6pm at 69 W. Washington. Training is provided by Cabrini Green Legal Aid Clinic and the Cook County Public Defender’s Office. Attorneys may earn up to 2.5 General MCLE credits. Looking for a way to help immigrant families? On Saturday, May 6th from 11-3pm at the Mexican Consulate you can get trained and immediately provide assistance that day for families looking to plan for minor guardianships in the event of deportation. Chicago Volunteer Legal Services (CVLS) will provide the training, no prior experience is necessary, and Spanish-language interpreters can be provided if needed. Learn more or sign up. Circuit Court of Cook County Chief Judge Timothy C. Evans recently signed an order designating that individuals in police custody have access to an attorney. Prior to this, less than 1% of arrestees in Chicago police custody had an attorney. The Cook County Public Defender’s office and First Defense Legal Aid (FDLA) are joining forces to meet this need. FDLA needs your help to cover the shifts outside work hours. You can get trained to help on Tuesday, March 28th at noon at the ACLU office (180 N. Michigan).